Traveling? Need to shape up for those summer shorts fast? We’ve got you covered! You can do these 5 FREE YouTube workout videos without any equipment and in a small space making them perfect for your living or hotel room. Lift your buns, shape your thighs and sculpt your abs too with this short, but effective, barre style workout! The entire routine is squat and lunge free (plus, it’s floor work free!) making it a great alternative lower body workout if you suffer from knee issues. Want to tone, trim and slim your inner thighs? Create an inner thigh gap? Find out the best way to get thinner inner thighs (hint: you can’t sport reduce!) 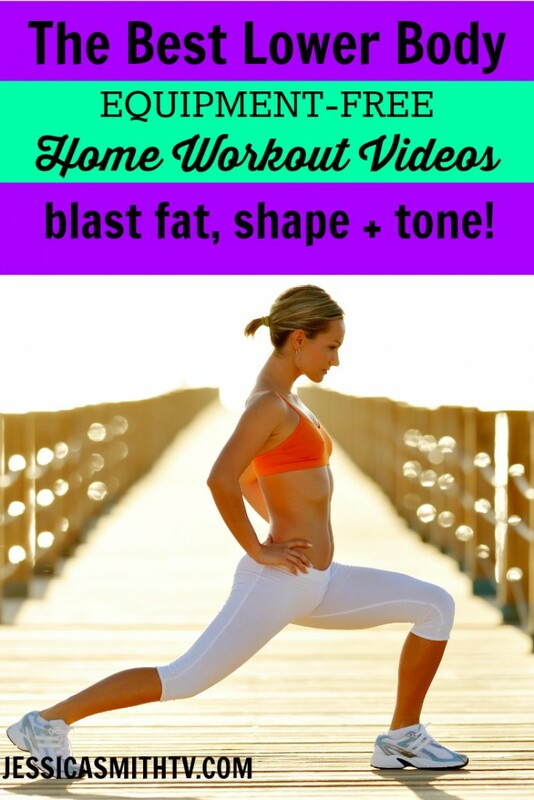 and try some of my favorite inner thigh exercises during this full length 10-minute workout. This quick set of exercises is guaranteed to fry your thighs using just your body weight and a small amount of space. Try this lower body circuit 1, 2 or 3 times through depending on how much time and energy you have. Sculpt and slim your hips, thighs and buns without doing a single squat or lunge! Jump right into this no equipment necessary, knee friendly, full length lower body workout — shoes are optional. Pull up a [sturdy] chair for this 10-minute lower body sculpting workout that is sure to have you ready for those summer shorts in no time! Jessica, thank you for all that you do, all the exercises, information and guidance you provide to your exercise community!! PS Thank your mom for participating in your exercise videos with you! Please share with her that she is inspiring to women like me, over 55, and working hard at regaining strength, flexibility and endurance!! Thank you Carol! I will definitely pass your kind words along to my Mom 🙂 Thanks so much for moving with us – we’re glad you are a part of our community! Thank you Jessica for giving us all kind of options!! love you!